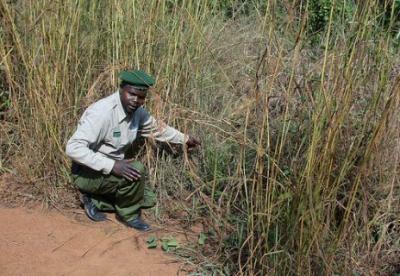 A soldier shows where LRA fighters were hiding for an ambush in 2013. Photograph by Jonathan Hutson/Enough Project. In recent months, the world has been absorbed by the unfolding tragedy in the Central African Republic (CAR), where waves of sectarian violence have left at least 2,000 people dead. Understandably, attention has been focused on Bangui and the western half of the country, where atrocities have been concentrated. Given the high level of conflict, largely between Séléka fighters and anti-balaka militias, mention of Joseph Kony’s Lord’s Resistance Army (LRA) is likely to be seen as a distraction. After all, current LRA violence in CAR pales in comparison to other atrocities, and the rebel group poses no existential threat to the country. Many might also argue that Western campaigns such as the viral Kony2012 video focused disproportionate attention on the LRA, and point out that the LRA seems to be fading away. Indeed, according to recent research, the group’s fighting force has dropped by as much as 90% since 1999, diminishing further by an estimated 20% in 2013 alone, and Kony is believed to have around just 170 fighters left at his disposal and little prospect of returning to Uganda to recruit replacements. However, while the LRA may not pose the greatest threat to the CAR’s security, there are still reasons to be concerned about one of Africa’s longest-running rebellions. Since May 2013, LRA fighters have abducted over 200 people in a quiet surge of violence in remote Séléka-controlled areas of eastern CAR. Many of the abductees have been forced to ferry looted goods from their homes into the bush before they are released. These supplies, looted under the nose of Séléka troops, are likely being used to resupply Kony and his senior officers, who are hiding out in nearby areas of the CAR and the neighbouring Sudanese-controlled Kafia Kingi territory. The LRA’s increased ability to find refuge in the CAR’s destabilised nether regions couldn’t come at a better time for the rebel group. In 2013, African Union (AU) forces from Uganda destroyed several LRA camps in Kafia Kingi, while their AU counterparts from South Sudan and the Democratic Republic of Congo (DRC) did the same to several of the LRA’s Congolese bases. However, AU troops don’t have sustained access to Séléka-controlled areas of the CAR, allowing LRA fighters to congregate there and commit looting raids with little fear of reprisal. AU military commanders estimate that 70% of all LRA combatants are currently in the CAR. Policymakers would be foolish to ignore Kony. History has shown that he will use safe havens to consolidate and expand his fighting force, as he did during the 2006–2008 Juba peace talks with the Ugandan government. Even a reduced LRA force can have a disproportionate impact on civilians, including the hundreds of thousands of displaced persons who remain so traumatised by previous LRA violence that they refuse to return home until Kony is caught. Furthermore, even if LRA violence continues to decline, the group is a dangerous pawn for regional leaders pursuing their own interests. In late 2013, much to the frustration of the AU, former Séléka leader and CAR president Michel Djotodia gave LRA forces food and medicine in a last ditch effort to repair his tattered image by enticing Kony to surrender. More recently, South Sudanese officials have used the group as justification for Uganda’s controversial military intervention against rebel forces allied with former vice-president Riek Machar. Even more worryingly, the Sudanese military may see opportunity in the chaos of CAR and South Sudan to once again renew support to the LRA, particularly if they ally with Séléka militia groups to establish de facto control of much of northeastern CAR. Another reason to be concerned is the fact that the LRA can also disrupt community cohesion and spark more localised violence in disturbing ways. Farming communities in southeast CAR have long accused the mostly Muslim Mbororo cattle herders of collaborating with the LRA, though in reality this happens very infrequently. Occasionally such accusations, made more potent by persistent disagreements over land, have escalated into mob violence and killings. Given how quickly sectarian tension has exploded into large scale atrocities in Bangui and western CAR, the LRA’s indirect role in exacerbating similar animosity in the country’s east should not be taken lightly. Uprooting the LRA from its safe havens in CAR and minimising its disruption of civilian security will be no easy task. The African Union must establish a way to coordinate its counter-LRA force with the new CAR stabilisation mission (MISCA), not to mention a UN peacekeeping force possibly on the horizon. UN and AU officials must also prevent regional governments, particularly Sudan, from throwing the LRA a lifeline as they pursue their own narrow geopolitical interests. Finally, local peace-builders in southeast CAR must work together to ensure that communal tension exacerbated by the LRA does not escalate into the sectarian violence tearing apart much of the rest of the country. The dwindling numbers in the LRA’s fighting force reflects the slow but steady progress of regional and international efforts to combat the rebels. But as tempting as it may be for policymakers to ignore the weakened LRA in the midst of the CAR’s chaos, they would do so at their peril. For the good of security and stability in this troubled region, it is crucial Kony is prevented from establishing a safe haven in the CAR. Paul is a co-founder and currently serves as the Project Director of LRA Resolve. He also oversees the organisation’s research and policy development, and co-directs the LRA Crisis Tracker, a multimedia platform that illustrates LRA atrocities in near-real time. Follow him on twitter at @pauldronan. Michael Poffenberger is the founding director of The Resolve LRA Crisis Initiative. Follow him on twitter at @mvpoff.